Heirloom Quality All Steel Construction Enamel Paint Chrome Windshield, Steering Wheel & Hubca..
38"L x 17"W x 19"H Heirloom Quality All Steel Construction Enamel Paint Chrome Windshield, Steeri.. This Black Beauty is Heirloom Quality All Steel Construction Enamel Paint Chrome Windshield, Steer.. 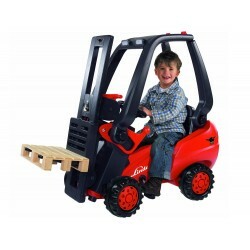 Durable childrens tractor with precision chain drive and trailer, Ackermann steering, high backrest,..
Childrens fork lift truck in the original design of the new Lime tree series 394. Removable operator.. In a word "Cool". Anyone driving this flamed up bad boy will definitely be cool. Just think of how e.. Bright and Bold..."That's the Bumble Bee" Features: Working Headlight Sealed Ba..
Quality construction that is built to last ! Features: Sealed Ball Bearing Drive&.. The Murray® Comet vintage pedal car is also sometimes called the Buick Torpedo. The body styles are .. Bent Wings High Traction Rubber Tires Sealed Ball Bearing Drive Non Slip Pedals Pa..